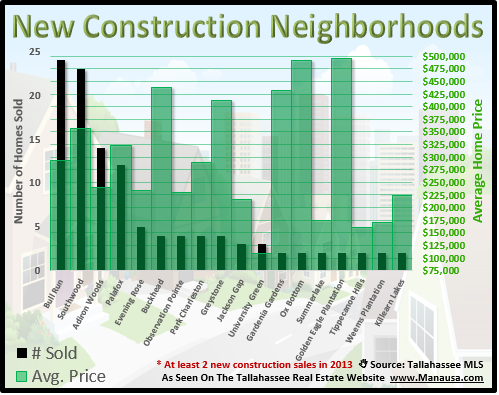 Coming off a historic-slow 2012, the top new construction neighborhoods in Tallahassee have really heated up in 2013. Even though existing homes are still selling below replacement cost, some buyers are just drawn to owning a new home. Not unlike the car industry, you get value when you buy "used," but some just love that new car (home) smell. So if you are thinking about buying a new home in Tallahassee, this report will show you what's available, what's been sold, and how much these modern homes are going for. For the purpose of this report, I chose every subdivision in Tallahassee that has recorded at least two new home sales this year (through November 6). The following real estate graph shows where the sales are happening and the average prices that the builders are fetching. The top new home communities are organized from left to right by number of closed home sales recorded in 2013 (black columns measured on the left vertical axis). Additionally, the average new home sales price is shown in green (and measured on the right vertical axis). 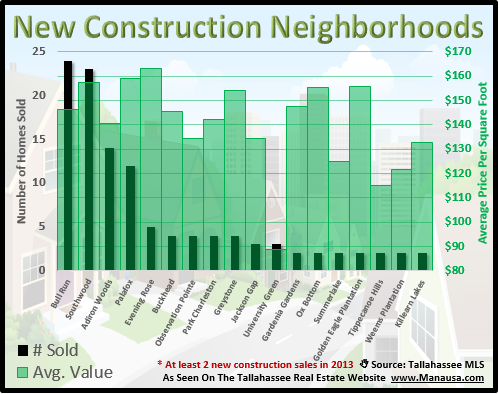 As seen above, Bull Run and Southwood are the two dominant new construction neighborhoods in Tallahassee. The cost of building a new home continues to rise, as the following graph shows (but for a few exceptions), homes are starting well above $130 per square foot. It is important to note that the values shown in the graph above include the cost of land, so as an example, the $141 per square foot in Adiron Woods delivers a 1,700 square foot home for $240,000. So assuming the land value is roughly $50,000, we can conclude that builders are delivering a 1,700 square foot house at a new construction price of roughly $112 per square foot. We can perform this same type of analysis on any subdivision in Tallahassee, and it provides interesting information for people who are thinking about buying an existing home versus building a new one in any particular area of town. The following map shows all new home listings in the Tallahassee MLS. Simply click on any property marker if you want pictures and information on a specific house for sale. You can also make the map more specific by tweaking the criteria in the header of the map (price/beds/baths/size). If you are thinking about buying a home, whether new or used, just drop me a note and we can schedule a time to make sure you make an informed decision and that you get the best price for the home that you want.